Oakwood Toluca Hills in Los Angeles will quickly become your favorite home away from home, nestled conveniently between Hollywood and Burbank, California. The beautiful hill views and lush landscaping will make you forget how close you are to the city. Located at 3600 Barnham Boulevard, it is located just one mile from Highway 101 and about two miles from Highway 134. Warner Brothers, Universal Studios and several other production companies and major studios are located within a short drive. If downtown Los Angeles is your destination, a twenty minute drive will put you in the city’s financial district. The close proximity to restaurants and boutique shopping centers makes it easy to enjoy a leisurely afternoon without having to commute across the city. 24-hour courtesy patrols and customer service help ensure a safe, comfortable atmosphere throughout the complex. Oakwood Toluca Hills offers high-tech fitness centers with private trainers to help you keep up with your fitness regimen. If you’re looking to blow off some steam, you can shoot hoops on basketball courts located within the complex. If tennis is more your speed, play a few matches on the lighted tennis courts! Swimming pools and volleyball courts are also available for guest use. Kids can get their exercise too, at the “Toluca Town” playground, equipped with a variety of fun and interesting structures to challenge their minds and bodies. When you’re ready to relax, partake of an onsite massage, or luxuriate in the Jacuzzi or steam room. An onsite spa and the “Judy Lea” salon will keep you looking your best. If you need to host a small meeting or an entire group, you will find a spacious clubhouse with full conference facilities and rehearsal spaces right on the grounds. A business center with internet access allows you to separate work and home, with a wide range of office amenities available. Parking is never an issue. Both open and reserved parking makes it easy to have your own vehicle at the ready to take you where ever you might want to go. Rental car service is also available. There is even an onsite car wash service to keep the road grime at bay. The convenience store gives you immediate access to the little things you might want or need. They also offer freshly made sandwiches for those times you just don’t feel like cooking, or need a quick lunch on the go. Studio, one and two-bedroom apartments are available either short or long-term. Beautifully furnished, they also offer ceiling fans, air conditioning, spacious patios or balconies, luxurious wall-to-wall carpeting and optional fireplaces. Studio apartments offer a full kitchen, while one and two-bedroom units also include dishwashers. Trash chutes are available on every floor. Small details, such as custom paint and crown molding lend an air of domestic sophistication, with added touches of luxury, such as the Oakwood Dream Shower and spacious closets. Onsite laundry and dry cleaning are offered, as well as housekeeping to keep your space in tip-top shape. Oakwood Toluca Hills offers some of the best long and short-term temporary housing available in the Hollywood area, with a comprehensive range of amenities. 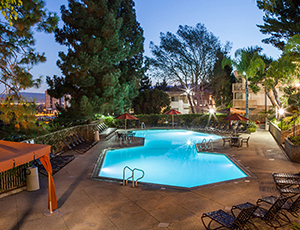 Whether for one person or an entire family, it’s a great choice to make your stay in the Los Angeles area comfortable and stress-free. Oakwood Toluca Hills in Los Angeles will quickly become your favorite home away from home, nestled conveniently between Hollywood and Burbank, California.